MILLER, Clarence Benjamin, a Representative from Minnesota; born in Pine Island, Goodhue County, Minn., March 13, 1872; attended the country school, high school, and the Minneapolis (Minn.) Academy; was graduated from the academic department of the University of Minnesota at Minneapolis in 1895 and from the law department of the same institution in 1900; superintendent of the public schools of Rushford, Minn., 1895-1898; was admitted to the bar in 1900 and commenced the practice of law in Duluth, Minn.; member of the State house of representatives in 1907; elected as a Republican to the Sixty-first and to the four succeeding Congresses (March 4, 1909-March 3, 1919); unsuccessful candidate for reelection in 1918; member of the congressional investigating committee to the Philippine Islands in 1915; special investigator for the War Department to the western front in France in 1917; elected assistant secretary of the Republican National Committee in 1919 and was chosen its secretary in 1920; engaged in the practice of law in Washington, D.C.; died in St. Paul, Minn., January 10, 1922; interment in Pine Island Cemetery, Pine Island, Minn.
Papers: In the Duluth Federated Trades and Labor Assembly (Duluth, Minn.) Organization Records, 1892-1942, 6.5 cubic feet. Other authors include Clarence Benjamin Miller. An inventory is available in the repository. Miller, Clarence Benjamin. The Non-Partisan League and Its Leaders: Speech of Hon. Clarence B. Miller, of Minnesota, in the House of Representatives, June 8, 1918. Washington: Government Printing Office, 1918. ------. The Poison Book of Lindbergh, Officially Endorsed by the Townley League Organ. An expose in Congress. [St. 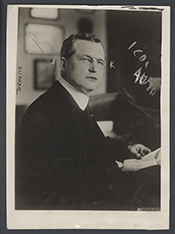 Paul?, Minn.: N.p., 1918? ].